As of this writing, Mayor Rodrigo R. Duterte again stated formally that he will not run for the highest office in the country. According to him, he will only run if his daughter former Davao City mayor Sara Duterte-Carpio will seek mayoral position in Davao City. For his loyal supporters and voters, the announcement was a big disappointment and of course his political rivals will only take this with a shrug and not of finality as the deadline for filing of candidacy is still days ahead. 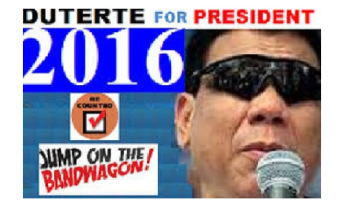 What is needed then is to encourage more people to join in the Duterte for President Movement crusade. I'm joining through this post to inform everyone about the top reasons why he should be the next president of the Philippines. Here are a dozen reasons to be convinced to vote for Duterte in the 2016 national elections. 1. His own brand of politics is the best follow up to “Daang Matuwid.” President Aquino’s sloganeering fortunately did not end up as just mere mince of words. Depending on how you look at it, there were indeed some considerable and tangible achievements when it comes to curbing graft and corruption such as impeachment of Supreme Court Justice Renato Corona and the still on-going imprisonment of former President Gloria Macapagal Arroyo. These two incidents proved once and for all that the government can nail down a big fish. 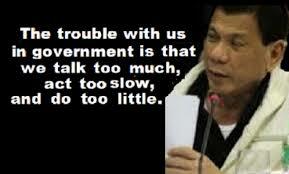 Unfortunately, graft and corruption is just one of the social issues that need to be addressed. Crime prevention, dismantling of drug syndicates, strict implementation of laws, and excessive political will are also needed. These are just some of the things that Mayor Duterte is famous and notorious for. Because of his guts and courage, he was able to transform Davao City into one of the safest cities in the world; not bad for a city whose reputation decades ago was compared to Nicaragua. 2. He is an action man; thus, he is a problem solver. He did not seek re-election of office as Congressman of the First District of Davao because he got bored and all that he did was to watch movies, timed in, sat there and here, and among other idle things. He is willing to stake his reputation and dared those who said that he is breaking the laws just to set things in action. Among his important achievements is the creation of a 911 and Public Safety Office in Davao City and this one rivals the emergency system of the U.S. The whole nation will be deprived of this kind of government service if he will not become president of the Philippines. Yes, DILG has its own emergency response unit and team but we need to hear stories just how effective it is in delivering the same kind of response with the one created by Mayor Duterte. He was able to implement a Liquor Ban and Anti-Smoking Laws successfully, he significantly reduced levels of drug problems in the city, implemented unfavorable traffic laws (Speed Limit Ordinances in Davao City), and among other things. For some, these are too trivial but when you look around the country, almost all cities and municipalities find it very hard to implement their own laws and ordinances. Clearly, Duterte can share to these local leaders how he did it successfully. 3. He is not considered as a traditional politician. 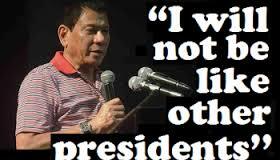 He can be considered as the true epitome of the political principle from the people, by the people, and for the people. He was never known to have exhibited political patronage; yes he has his own political party in Davao City but he chose his people well. He speaks as if he owes no one, he is willing to face the consequences of his attacks and tirades on the establishments and he doesn’t give a damn. 4. He commands respect from both local and international leaders and organization. He landed on the cover of Time Magazine. He was supposed to be awarded as Mayor of the Year by an international organization but he turned it down citing reason that there is no need for this kind of award as it is expected from him to be an excellent Mayor as that’s what people expected from him. It will take ages in order to list down all the awards amassed by the city itself under his leadership; thus, it is suffice to say that these awards, merits, and recognition are tangible manifestations of the respect he earned over the years. Isn’t it wonderful if one day the Philippines as a whole will earn these awards as well like “Most Liveable Country" and "The Safest Country in The Planet?” All of these recognition indicate that he has polarized different sectors of society and is a manifestation of confidence that he is the best person to lead this country from 2016 and onward. 5. He advocates federalism. It has long been an issue that the country is ruled by Imperial Manila and Duterte believes that in order for the country to prosper faster is to change the system of government from presidential to federal. In an interview with Sun Star Davao last December 2014, he described federalism as the National Government remains the seat of power but will no longer weld all power and subjugate it to the local government. In this scenario, he believes that local government can effectively function within the area of responsibility as the National Government no longer interferes when it comes to running a local government. 6. He is born to a political family. It cannot be denied that he is not adverse when it comes to political dynasty but Grace Poe is wrong to assume that federalism will perpetuate political dynasty. His father was a former Governor of Davao (which was undivided at that time) during the fifties and was a former mayor of Danao City (Cebu province) before he became a governor. The Duranos and Almendrases are the political families which can be considered as his relatives too. If belonging to a political family is one of your considerations, definitely he has the pedigree. 7. He is honest. As a politician, he was never afraid to discuss his personal background. In fact, he acknowledged his womanizing ways; thus, he did not make it difficult for his wife Elizabeth Zimmerman to nullify their two decades old marriage. In addition, he is not also afraid to discuss that he was kicked out from Ateneo de Davao University because of his street smart ways when he was still in high school. 9. He is a lawyer, a fiscal, and a prosecutor before he became a mayor. This is probably the reason why he is not afraid to admit his relationships with the extra-judicial group DDS (Davao Death Squad.) Unlike other mayors and politicians, he knows the laws and breathes the law. Unlike other politicians, he implements the law for his constituents, not for personal aggrandizement. If you believe that a leader should have a good grasp of the law, then he fits your bill. a. Technical Skill – being able to understand the processes and technology involved in many operational activities. In his case, he knows that involving the public, as they are the ultimate beneficiaries is a must. Thus, he has a weekly TV program “Gikan Sa Masa, Para sa Masa" (From The Masses, To The Masses) where issues and concerns are discussed and very often, he reveals what is on his mind. b. Human Skill – it is the ability to work as a group member effectively and at the same time be able to lead the team to where he wants it to be. It is a known fact that he detests the NPAs but it doesn’t mean he will exclude them in his agenda. Creative consultancy is one area where you can say that he is unique. His ability to include all members of society in his leadership and consultancy is legendary. He does not exclude, in fact, he is also supportive of the LGBT group and this alone speaks hugely of his human skill. c. Conceptual Skill – it is the ability to view the organization as a whole and recognizing various functions of the organization and its connection to each other. He knows that as a politician, one aspect affects the other. Thus, you have in Davao City ordinances that are not only good for business but also good for families as well. While the Anti-Smoking and Liquor Ban deprives bars, restos, and bistros of huge gross sales, however, it protects families because kids and youngsters abuse to smoking and alcohol is quite limited in the city. Since there is a curfew, businesses have lower operating expense as by 2 A.M, establishments are closed and they do not have to pay overtime and other incidental expenses relative to having their business open from sun up to sun down. All of these ideas explain why he has an excellent record in terms of good governance. It is wrong to assume that he is a future dictator but very right to say that Filipinos need good leaders with excellent administrative skills. There is no need to sow fear and intimidate Filipinos just to make things work. Mayor Duterte has shown that effective and no-nonsense approach is the right ingredient to make Filipinos follow and observe the laws, to have them participate in the development of the country, and make them believe that this nation will be great again. 11. He can discipline the entire nation. Not only will the whole citizenry mind their manners and behaviors but even criminals will make it a point to behave in order not to earn the ire of Duterte. His own brand of solving crimes is legendary and many criminals experience shivers on their spine each time they hear that Duterte is coming for them. Discipline is one of the reasons why Davao City was transformed into what it is right now and it can be done in the entire country and only Duterte can do it. According to many, no country can be progressive if the citizens are not disciplined and law abiding. 12. He already has a platform of government and is considered as pro-people. Unlike other presidential wannabees who are still full of rhetoric even if the next election is months ahead, Duterte has already revealed some of his specific programs like exempting individuals with less than P25,000 to pay income taxes, burning documents of private individuals attempting to bribe government officials, and rigidly implement anti-corruption laws. Of course, despite these dozens of reasons, Mayor Duterte has some flaws. As mentioned earlier, he was not coy and ashamed with his imperfections but one thing that he assures us is that he will definitely make life better for his constituents even if it means breaking some laws. There is no such thing as a perfect candidate but there should be one whom Filipinos can put their trust and confidence that he or she will restore the faith in government. 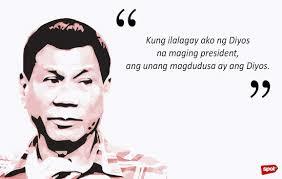 The Filipinos have tried a president who wanted to have a government like hell but run by Filipinos, elected the man from the masses, the poor boy from Lubao, suffered under a dictatorship, courted with disaster from a widow, had a roller coaster ride with a military man, joked with a movie star, learned economics the hard way from the daughter of that poor boy, and traveled with a son of a former president and still the country is suffering. 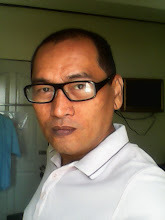 The nation has experienced short term presidency with a politician from Visayas and therefore it is high time that Mindanao should also produce the best president of the country. how much do you earn from this blog? Hello there! We earn nothing but pennies but gain better rewards by being able to offer public information. If they put advertisements from for example "Petron" then they would see more monthly money.. more Ads equals more money.. but many people Hate and despise ads so they would lose popularity because its nice that this website doesn't have them and instead has good information. Hello there! We do actually have ads but the earnings are very minimal. We actually spend more than what we earn here. We value information over revenue. I believed that paying the rebels is not listed as one of the reasons to vote for Duterte as the next president of the Philippines. I did mentioned that his people skills is one of the reasons and paying rebels is ONE OF THE WAYS to deal with this kind of people, I partially find nothing wrong with it as I am a practical person. One must understand the dynamics of issues between the separatist groups and the government. There is no perfect solution but only manageable ones and it all depends on the situation. One that is appropriate decades ago won't be appropriate right now and the search for meaningful. collaborative, and gainful solutions is always evolving.